South African athlete Oscar Pistorius made history at London Games 2012 by becoming the first amputee sprinter to compete at the Olympics. 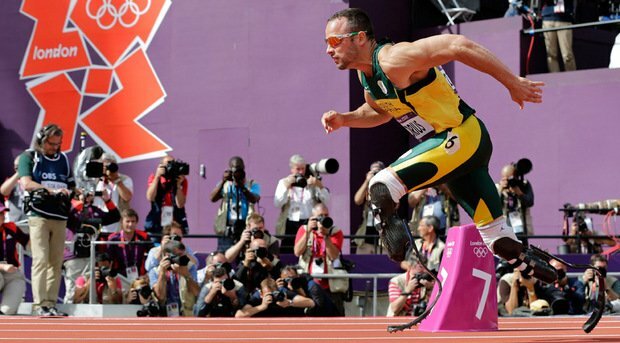 Oscar, Pistorius, a four-time Paralympic champion, 25, whose legs were amputated below the knee as a baby, finished second in his 400 m heat in a time of 45.44 seconds to reach Sunday’s semi-final. “I didn’t know if I should cry or be happy. It was such a mix of emotions,” Oscar Pistorius said. Defending champion LaShawn Merritt of the United States pulled up injured. The 26-year-old, who failed a drugs test in 2009, appeared to be still suffering with an Achilles tendon problem that affected him earlier in the season. He stopped running after 250m and crossed the line at walking pace. “It’s Olympic year – I tried to go for it, and it just didn’t happen,” he said. Oscar Pistorius was impressive in his heat, coasting over the line behind Luguelin Santos of the Dominican Republic, who won in 45.04. “Thank you so much to everyone who has supported me. Thank you so much to my family – I saw my gran in the crowd. It was the most amazing experience. “This crowd is amazing. I’ve run so many times in the UK and it feels like a second home to me. Oscar Pistorius ran in the individual 400 m at the 2011 World Championships but did not progress beyond the semi-finals. He also ran in the relay but, after running in the heats, he was omitted from the team which raced in the final as South Africa went on to claim silver. Oscar Pistorius is also due to run in the 4×400 m relay at London 2012. How fast a human can ultimately run?